This unique series features a collection of the most famous pieces from the classical guitar repertoire, and includes music scores, tablature and accompanying video. Great care has been taken to verify the fingerings of both hands in the material. Innovative tablature combines left-hand finger positions with rhythmic notation, allowing the reader to tackle very complex musical repertoire and polyphony. Therefore, this system provides an opportunity for anyone to learn pieces from these great composers, regardless of reading ability. 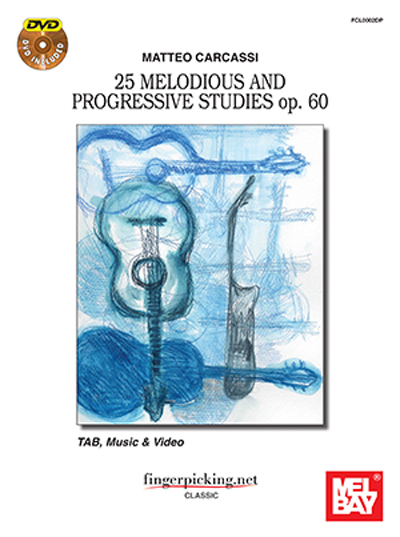 "Matteo Carcassi: 25 Melodious and Progressive Studies op. 60" provides basic to advanced studies for the guitar. The etudes will also strengthen guitar playing in other musical styles. They are a great fingerstyle exercises for any guitarist, and are often used by flamenco players.